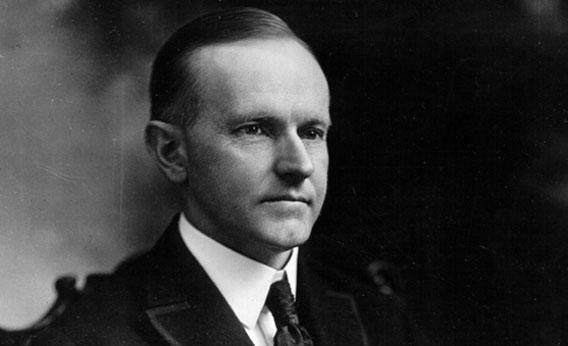 Calvin Coolidge, 30th President of the United States. But Coolidge was one of America’s wisest and most prudent leaders. His modest autobiography is, along with the memoirs of Ulysses S. Grant, one of the finest, most eloquent American narratives I have ever read. Coolidge was an American to the very marrow. He believed in charity, hard work, thrift, deregulation, lower taxes, G-d, a rigorous liberal arts education, and baseball. Coolidge understood the dangers of big government, the virtues of family, and the civic-mindedness of business leaders. I know, this all sounds very quaint to those who live in Obamaland. Coolidge was famous for his tight-lipped manner. He didn’t yammer on and on, and he certainly was not fixated on Calvin Coolidge. This, in deep contrast to Barack Hussein Obama who delights in talking us into a coma, and without fail, lecturing us on the greatness of, who else? Barack Hussein Obama. Endlessly. We live in an age where our politicians and the chattering classes act as if their actions are without consequences. Calvin Coolidge, with uncommon common sense, understood the simple equation between action and reaction. As I went about with my father when he collected taxes, I knew that when taxes were laid someone had to work to earn the money to pay them. I saw that a public debt was a burden on all people in a community, and while it was necessary to meet the needs of a disaster it cost much in interest and ought to be retired as soon as possible. During my first term I began algebra and finished grammar. For some reason I was attracted to civil government and took that. This was my first introduction to the Constitution of the United States. Although I was but thirteen years old the subject interested me exceedingly. The study of it which I then began has never ceased, and the more I study it the more I have come to admire it, realizing that no other document devised by the hand of man ever brought so much progress and happiness to humanity. The good it has wrought can never be measured. Amherst [college] had been founded by pious men with the chief object of training students to overcome the unbelief which was then thought to be prevalent, that religious instruction was a part of the prescribed course, and that those who chose to remain would have to take it. If attendance on these religious services ever harmed any of the men of my time I have never been informed of it. The good it did I believe was infinite. Not the least of it was the discipline that resulted from having constantly to give some thought to things that young men would often prefer not to consider. If we did not have the privilege of doing what we wanted to do, we had much greater benefit of doing what we ought to do. It broke down our selfishness, it conquered our resistance, it supplanted impulse, and finally it enthroned reason. Our talents are given us in order that we may serve ourselves and our fellow men. Work is the expression of intelligent action for a specified end. It is not industry, but idleness that is degrading. All kinds of work from the most menial service to the most exalted station are alike honorable. One of the earliest mandates laid on the human race was to subdue the earth. That meant work. Michele Bachmann was asked which President she would carve into Mount Rushmore. Her first response was Ronald Reagan. Then, after some reflection, she added Calvin Coolidge. Of course, the media and the elites laughed. And Sarah Palin, in her book “America by Heart”, praises a speech Coolidge gave on the 150th anniversary of the Declaration of Independence. Palin and Bachmann, as usual, had it right. Which is why the left demonized these two spectacular ladies. There is nothing more dangerous to a Democrat than a smart, beautiful, articulate, Conservative woman. Unless it’s a smart, beautiful, articulate, black Conservative woman. Reagan, upon entering the White House, removed the portrait of Harry Truman and replaced it with a Calvin Coolidge. For American Conservatives, William Buckley is cool. Ronald Reagan is super-cool. 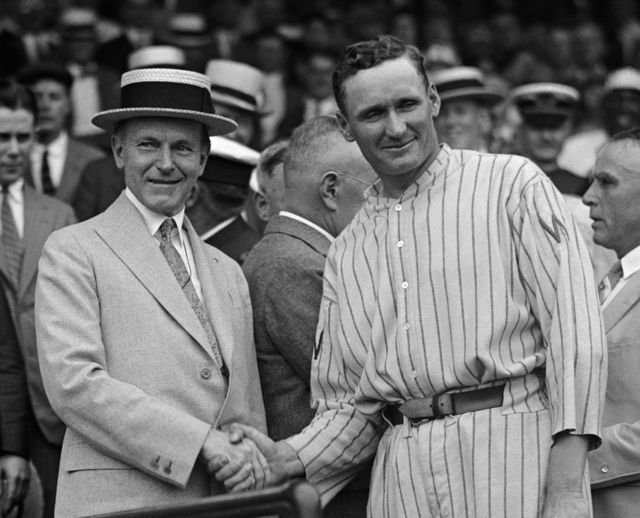 But for Seraphic Secret, Calvin Coolidge, a pre-New Deal thinker par excellence, is the man who put the cool in cool. Here’s just ONE example of what Debbie Schlussel thinks of Sarah Palin. His modest autobiography is, along with the memoirs of Ulysses S. Grant, one of the finest, most eloquent American narratives I have ever read. Didn’t Grant, while a fine general, run a very corrupt administration when he was President? Amity Shlaes in The Forgotten Man covers a lot of what Coolidge and his Treasury Secretary Andrew Mellon accomplished. I suspect know the current occupants of those positions would laugh at the suggestion that Coolidge and Mellon could do a better job today – it’s so much more complicated than it was 100 years ago don’t you see? There’s the famous story of someone telling Coolidge he had bet that he could get the president to say three words and Coolidge replied “You lose.” With Obama it would have to be a bet on getting him to say less than 1,500 words – 1,500 boring and vapid words. Because those are the only words I hear from Obama. Any president so favored by RR deserves serious consideration for Mount Rushmore. I’m ashamed to know so little of this man and his contributions Whenever I read quotes from him, I marvel at his wisdom and sense. I must read his biography and get to know him better. Not to mention a rather apropos tidbit: By pushing Congress hard to cut taxes in half and spending in half President Coolidge caused the Depression of 1920 to evaporate with a resultant little period of prosperity known as The Roaring 20’s. What, you never heard of the Depression of 1920 but you heard all about how FDR got us through the Depression of 1930 in only 10 years and a world war? Tsk. Must have been somehow left out of your civics class in high school by mistake. Betcha Obama never heard of it either. The only president I can think of who I would rate higher than Coolidge is Jefferson. I think George Washington should rate pretty high on that list. The template. And maybe Andrew Jackson, James K. Polk and TR. To go along with RR and JFK. Yes, of course. But Washington, Lincoln and then…the underrated Polk? FDR if only for the events of his time, but not only. TR is somewhat forgotten but a man who was there to help. Andrew Jackson the quentessential American primitive. But, not always so primitive.In any case, no to Woodrow Wilson, LBJ and Carter. You know what Andrew Jackson did to the Cherokees, don’t you? I am not bringing a 21st Century sensibility tothis discussion. These were men who made America for us. They were smart and tough. Don’t get in their way was the message. If Andrew Jackson and the rest had not done whatever it was to the Cherokees and whoever else, there would no one around here to tut-tut about what Andrew Jackson did to the Cherokees. Those who enjoy the fruits of their actions are not exactly in a position to complain about them. Not to mention that the romanticization of the “noble savage” is a crock. Savages they were, noble they were not. They did worse to each other than the white man did to them. Right. These were hostile slave owning, castrating savages in the way of progress. Certainly not benign. Those who enjoy the fruits of their actions are not exactly in a position to complain about them. Yes, Lincoln. Then, President George Washington… Now, I’ve always had a fondness for Harry Truman and placed him high on this list. However, after this fine accolade by Robert, I may, like Reagan, have to replace President Truman with President Coolidge. This will require further study. Thank you, Robert, for the inspiration to do so. You are mistaken. WAshington comes first. He set the pattern and walked way from power. AS for Lincoln his great achievement was in defining the accord binding the nation. Many people, even educated folk, believe the war between the states was fought as a result of slavery. Not so. It was a conflict defined by secession. Taht was 1861. The Emancipation Proclamation was issued in 1863. Slavery was only the most obvious of many issues separating the agrarian south from the industrialized north. The country was heading into anti-slaveholding mode. Lincoln and his administration pushed the issue into what remains as our bloodiest and least forgiving conflict. Did slavery have to end? Yes. But, it was being winnowed away. The Lincoln administration put an end to its gradual dissolve. I knew that when taxes were laid someone had to work to earn the money to pay them. This resonates with me. But how can it be expected to resonate with a man who has held only public positions, whose remuneration was always from public funds, without real connection to the “work” he supposedly did? And it will resonate even less strongly with those who do no work at all and don’t want to, whose income derives from the work done by others. Of course that’s the Democrat plan. To employ so many federal workers and put into place so many welfare programs, that they can never be voted out of office. It’s called centralized planning AKA tyranny. Hmm. Thought I’d be first. I’ve thought well of Coolidge for many years, particularly because of his actions, as Governor of Massachusetts, with the threatened strike of the Boston Police force. Totally unrelated — I gave more attention to your right sidebar (now that I have you bookmarked) and I have read about Ariel. My younger son is to be 22 in five days. How desolate you must be! I’ve just prayed that G-d would give you solid comfort. Indeed, Reagan fired the striking air traffic controllers because he saw how Coolidge acted. Thanks so much for your kind words of comfort about our beloved Ariel. It means a lot to us that people care. The vital link between piety and civic virtue should put many to shame. One has to wonder how exactly he developed and sustained an appetite for elective office. Coolidge developed an appetite for office by watching his father, a community leader, who, by the way, swore Coolidge into office in their living room.